Good Day Ironkids, Parents, and Coaches! 1. Age Group: members must be 6-10 years of age. 4. Mechanics: a. Each Team will have four members running 400m (1lap around the track oval) one after the other. b. Each Team will be given a “baton” to hold and pass on to each other as they run around the track. c. In case there is a big volume of participants, organizers will create separate waves, and note down the best time for the winning teams- 1st, 2nd and 3rd place teams will be awarded. 1. Age Group: members must be 11-14 years of age. 4. Mechanics: a. 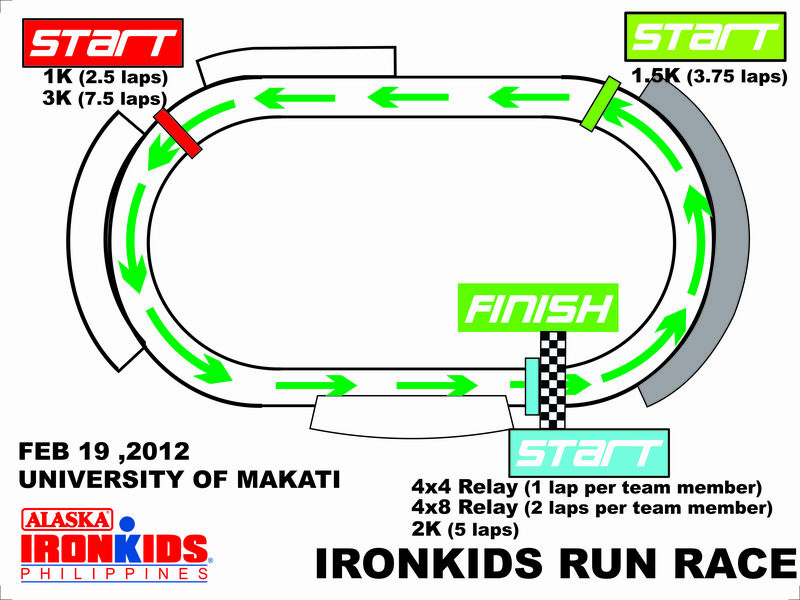 Each Team will have four members running 800m (2laps around the track oval) one after the other. b. Each Team will be given a “baton” to hold and pass on to each other as they run around the track. c. In case there is a big volume of participants, organizers will create separate waves, and note down the best time for the winning teams- 1st, 2nd and 3rd place teams will be awarded. Hi Ani! Saw you at the tent over at Timex Run… Sorry, I was so starstruck when I saw you. 😀 Would it be okay if I post this info on ironkids in my blog?